Here’s a look at Demolition‘s latest print ad featuring Tate Roskelley. 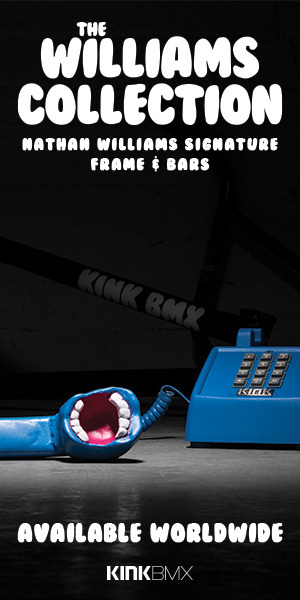 This was ran in the new issue of ART BMX Magazine through their distributor in France, Ezco. The end of the year is coming up and I feel like there’s been an abundance of wild videos that dropped this past week because of that. I dug through the Daily Section and pulled out 16 edits that you definitely don’t want to miss. We’ve got guys like Brian Kachinsky, Bruno Hoffmann, Mike Hoder, Dillon Lloyd, Anthony Watkinson, Anton Arnarson, Tate Roskelley, Seamus McKeon, Mark Webb and more all waiting for you in this weeks edition of Video Recap. Let’s get into it! Tate Roskelley sets that creativity bar to maximum for this new edit! This is what we call a MUST SEE. “In honor of the last day of the world, and subsequently the end of the BMX world as you know it, we invite you to delve into the creative mind of Mr. Roskelley for a few minutes. From biblical water travel capabilities, to cartoon inspired banana peel slides, to tricks that arguably are achieved with a funny looking unicycle and not a bicycle…Tate is constantly pushing the envelope in terms of what the parameters of BMX bike riding actually are. In Tate’s mind they simply don’t exist, and they shouldn’t in yours either. It’s a brand new time period in Mayan history, a new year is around the corner, and hopefully it’s a time for more fresh ideas like this in BMX…go out there and get creative! Filmed by Jordan Utley & Elf Walters. Tate Roskelley’s section from the Demolition Parts “Last Chance” video is too good to miss! Amazing creativity and originality. About time Demolition Parts uploaded our favorite section from the “Last Chance” BMX video! Check out Tate Roskelley blowing up the creativity scale with amazing spots and riding. Absolutely AMAZING. “Demolition Parts Last Chance DVD Online. MOREEEEEEE! That’s all I was thinking when this ended. Tate Roskelley brings some serious originality to the table as always for this new promo for his signature Drifter V2 frame from Volume. Here’s a look at Volume‘s latest print ad featuring Tate Roskelley and his signature V2. Drifter frame. That’s so wild! OSS have released the entire “Denver Nugs” DVD online for your viewing pleasure. Kick back and check out all 20 minutes of goodness.